GetLinked® Software Forum • View topic - Does GetLinked Software have a payables module that works "Stand-Alone" and with different suppliers' invoices (Vouchers)? Does GetLinked Software have a payables module that works "Stand-Alone" and with different suppliers' invoices (Vouchers)? Post subject: Does GetLinked Software have a payables module that works "Stand-Alone" and with different suppliers' invoices (Vouchers)? Yes, GetLinked Software has a "Stand-Alone" payables module that you can use at each of your locations. The APLink (Accounts Payable) module allows location managers to input all of their invoices (vouchers) from suppliers or vendors right at the store and transfer them to the corporate office. Those transactions (vouchers) can then be electronically imported into your accounting system for payment. The subscription price is the same as all other GetLinked Software modules. 3. Choose Single Voucher Import. You can see how managers use this window to enter invoice totals and the details (ex. Dairy, Paper, Janitorial, etc.) all on one screen. These invoices can be transferred any time you want (ex. daily, weekly, monthly, manually, etc.) basis and GetLinked Software will be validate and transfer them into your Accounts Payable system for you. Interfaces to many existing "point of sale" and "supplier" systems such as USFoods, Sysco, CBORD, Foodtrak, Micros, Aloha and more. If you purchase an annual subscription and decide later to switch between systems (ex. switch from USFoods to GetLinked Stand-Alone APLink module) there is no additional charge. To purchase the APLink module or see the specific payables systems available click here: Buy Now. 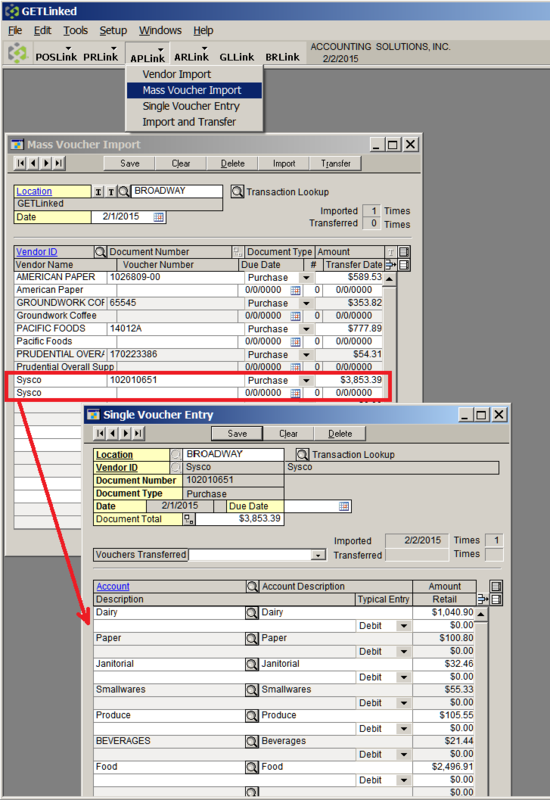 Does GetLinked Software Accounts Payable module import Summary or Detail Invoice (Voucher) data?